Cyclone Pam was the strongest storm to hit Vanuatu in recorded history, affecting 188,000 people. On Friday 13 March 2015, Cyclone Pam tore through the island nation of Vanuatu with devastating force, claiming lives and destroying homes, hospitals and crops. Thousands were displaced from their homes and 50-90% of infrastructure was destroyed, with the remoter islands suffering the worst damage. In the immediate aftermath of the cyclone, CARE staff on the ground in the southern islands of Tafea province were joined by specialists in water and sanitation, shelter and food, to provide emergency relief supplies and to assess and plan for the longer term recovery process. Cyclone Pam struck Vanuatu with wind speeds over 260 kilometres an hour, heavy rainfall and storm surges. Houses were flattened, trees uprooted, and power lines damaged. Bridges collapsed and roads were blocked by debris. Buildings that were meant to serve as safe havens, like hospitals, schools and churches, were severely damaged. In the capital, Port Vila, an estimated 85% of homes were destroyed and most areas of the main island, Efate, had no electricity and running water. CARE focused its efforts on supporting people with water, sanitation, shelter and food in the remote islands of Tafea province, where CARE was working before the cyclone. The southern islands of Erromango, Tanna, Aniwa and Futuna were directly hit by Cyclone Pam and people had limited protection from the storm. The Pacific Island nation of Vanuatu consists of approximately 83 islands spread over hundreds of kilometres of ocean in the heart of the South Pacific, between the Solomon Islands and Fiji. Vanuatu is highly vulnerable to cyclones, as well as rising sea levels due to climate change. 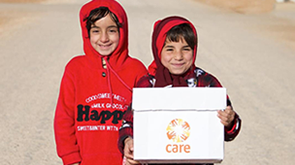 CARE was the lead agency responding in Tafea province in the south, where 32,000 people live and where the humanitarian needs were immense. Prior to the cyclone, CARE pre-positioned relief supplies on Vanuatu’s most populated island of Efate. We worked closely with Vanuatu’s National Disaster Management Office and with communities across Ambrym, Ambae, Malampa and Taefa provinces to help them prepare for the cyclone. distributing seeds and tools in Erromango, where CARE has launched a ‘Women’s Seed and Tool Bank Initiative’ to encourage women to form committees to plan and distribute seeds and share tools in ways that meet both household and community food needs. CARE will also provide information and training and assist groups to plan for seasonal planting and seed-saving. CARE has been working in Vanuatu since 2008 with a specific focus on helping communities develop emergency preparedness plans and the capacity to respond to and rebuild after disaster.